Good morning, I’m up early before the sun again this morning, but thankfully got a good night’s sleep last night and feeling much better. Amazing how emotional and drained lack of sleep can make me feel, not fun! Last night hubby and I had another amazing dinner out for the Sacramento Vegan Chef Challenge, I’m determined to get to more restaurants this year to support this great challenge. You can follow them on Facebook to see all the creative vegan dishes, I already have next week’s restaurant picked. 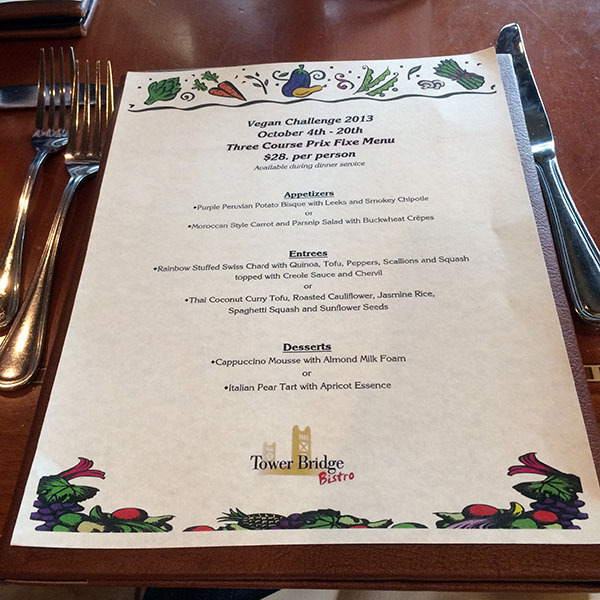 We headed to the Tower Bridge Bistro last night because their vegan prix fixe menu just looked wonderful. We originally planned to take hubby’s gas car since the drive requires a 70-ish-mile round trip on the highway, but the screw jammed into the rear tire had different plans and we took my EV instead. I was a little nervous about this because the trip is pushing the highway range since EVs tend to do better in city driving with regenerative braking, but turns out we had plenty of charge left to get home and there were plenty of available free charging stations in the parking garage to top off the battery for free “gas”. The experience made me feel better about pushing the range for future trips and relying on public charging more. 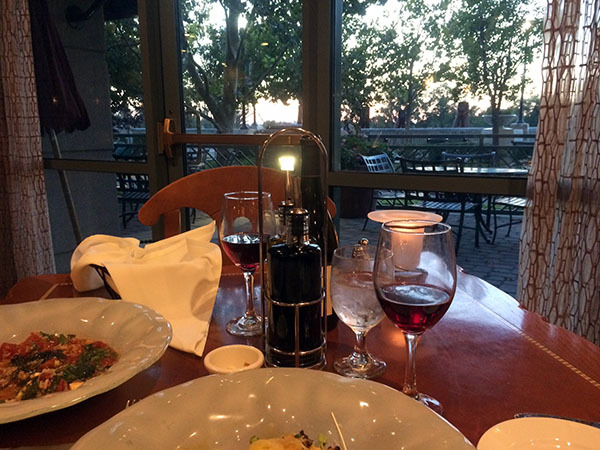 We scored a great table with a gorgeous view of the sunset over the river. Between hubby and I, we ordered everything on the menu which looked amazing! 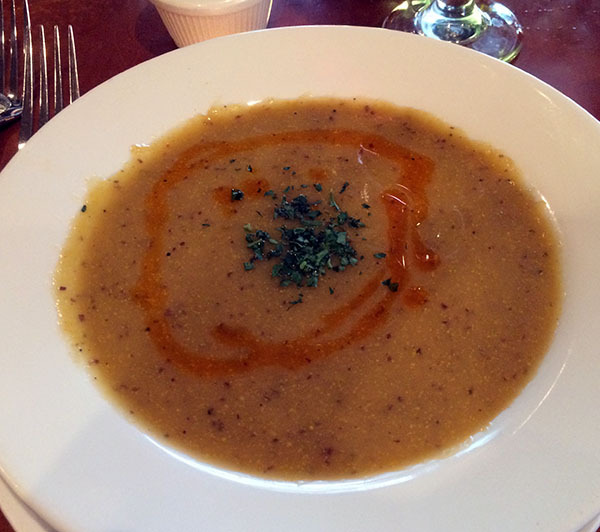 I started with the Purple Peruvian Potato Bisque and look at the lovely drizzle of spicy chipotle oil. 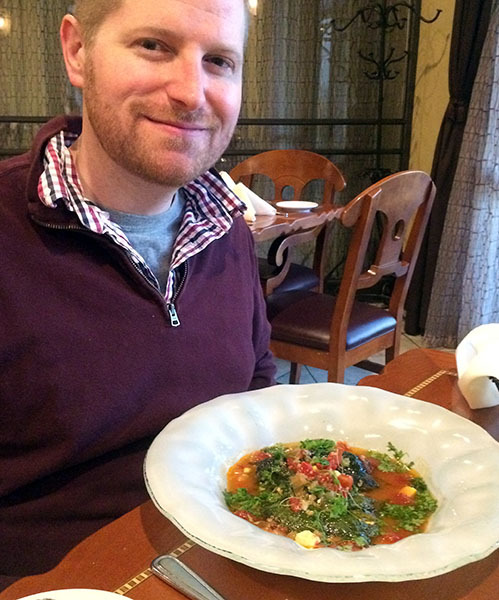 The soup was nicely spicy with a thick and hearty texture. The level of spice was a little daring, but it really seemed to set off the potatoes and other seasonings in the soup. Hubby absolutely adored this soup, so I’m looking forward to when the recipe is released. 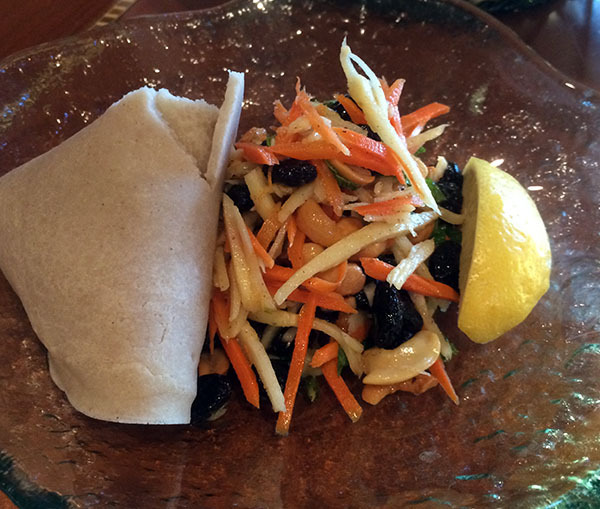 We also got the Carrot and Parsnip salad with Buckwheat Crepes which I adored. The crepes were chewy, hearty, and slightly sweet which paired well with the sweet and crunchy carrots and parsnips. 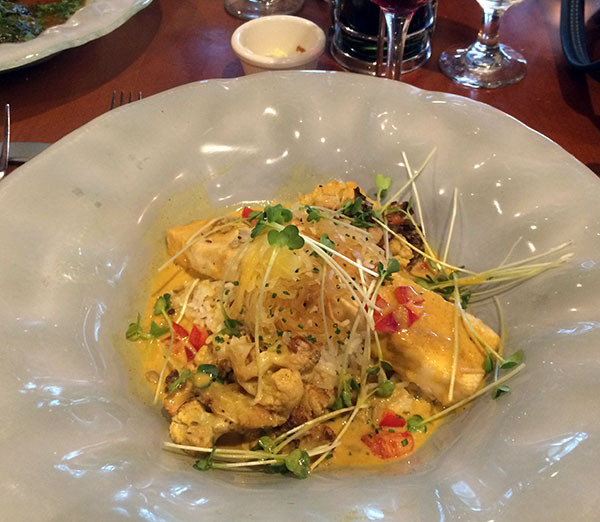 For my main dish, I went with the Thai Coconut Curry Tofu which was a work of art over a bed of spaghetti squash and rice and topped with delicate greens. The curry flavors took me back to a shrimp curry rice dish I used to have as a kid, but better with a creamier sauce and texture variety. I really liked the addition of crispy cauliflower slices and the tofu absorbed the curry flavors nicely. Hubby got the rainbow stuffed chard with tofu and quinoa which was completely different from my dish, but equally good. 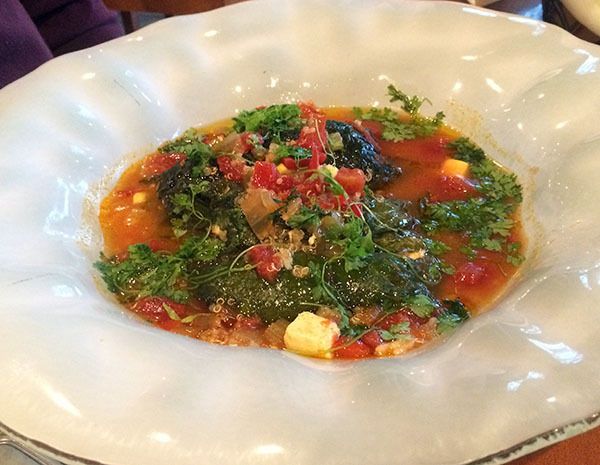 It was more like a spicy tomato veggie soup with quinoa and large, flavorful chunks of stuffed chard leaves. It also had a daring level of spice that was perfect for him. 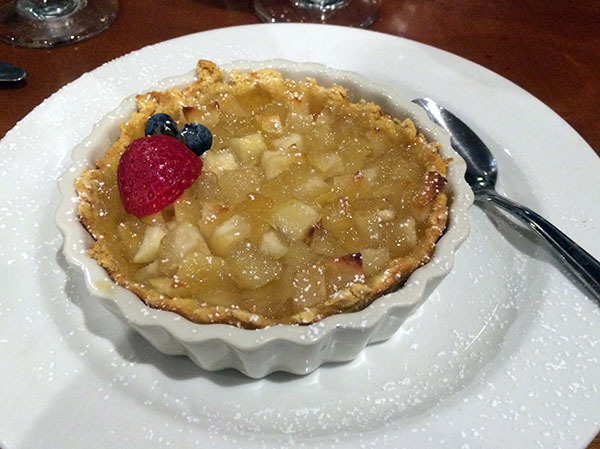 Dessert was also a great treat, I got the Italian Pear Tart with Apricot Sauce which was more like a warm, gooey pie. The cornmeal crust had a tough texture that was a little hard to cut through, but it added a nice crispy crunch to the soft fruit. I also liked that the dessert wasn’t too sweet and seemed to focus on the sweetness and flavors of the fruit and not overpowering it with too much sugar. 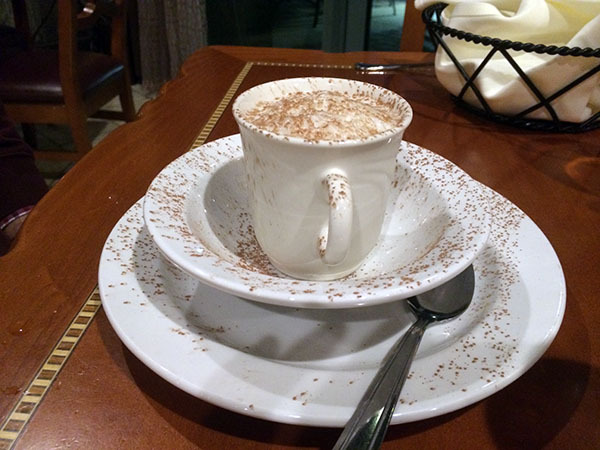 Hubby went for the Cappuccino Mousse which was beautifully served in a cappuccino cup. The texture was more like a gelatinous custard with a slightly sweet and very creamy coffee flavor in a lovely layered frothy presentation. A delicious way to combine coffee with dessert. Our overall dining experience was very positive and engaging since Chef Clay Purcell stopped by multiple times to ask our opinions on the dishes and chat. It was such a wonderful dinner out with a nice atmosphere, I highly recommend giving this menu a try if you’re in the Sacramento area and trying other restaurants participating in the Sacramento Vegan Chef Challenge. WOW! Awesome on the Vegan Foods AND the free ‘gas’!!!! NEVER take for granted where you live, my friend!!! We don’t have anything like that here! Eeeeek! I’ve never even seen a free ‘hook-up’ for an EV and that includes in Erie, Buffalo, Pittsburgh, and Cleveland! Eeeeeek! I really think I was born on the wrong coast! Lucky! Lucky! So true, I’m grateful we have a decent public charging network in this area. There weren’t any options for it when I lived in Florida either. Thanks for the gentle nudge, Jennifer. We do sometimes take for granted the many, many benefits of living in California. We also get a $2500 check from the state for leasing or buying an EV, in addition to the $7500 federal credit. 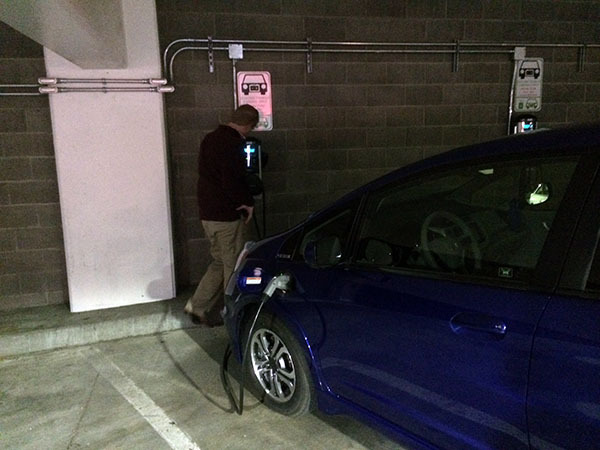 And…more and more public spaces have charging stations. Our local mall has 2, and my husband gets to charge at work for free. We are indeed lucky. Christine, it gets even better. You can go to the city’s parking office and get a $10 parking pass that allows you to park free in city garages, AND get free charging. I’m guessing you were in the one by Old Sac, and that’s one of the free ones. You can apply online, but have to go down to pick up the pass. It’s the neatest thing since sliced bread! California is rolling out the welcome mat for EV’s in many ways. I’m sure you know about the white stickers for the car pool lanes too. We love our LEAF! Next challenge stop for us…Tower Bridge. Oh yeah, I have one of those parking passes waiting for me, I just need to get to the office to pick it up which is a challenge on my work schedule. Thanks for the update! I’ve been thinking about getting the stickers, but I currently don’t commute in any of the lanes. That’s awesome about your LEAF, that might be my next car when the Honda lease is up. Are you a member of SacEV? If you want to improve your experience just keep visiting this site and be updated with the latest information posted here.